The Invergordon Archive - Invergordon Academy - Primary 7, 1966. Not a very clear picture but I think I can name a few. Front row:Sandra Ross, Barbara Grant, Graham Reynolds, Pauline Maclennan (my sister), Charlie Hercher, Wilma Burnett, David Jamieson, ?, ?. Middle Row:L-R Jean and Sheila Mackay, Tricia Aburrow, Alan Donald (I think). I have spotted a few more!!! - bottom right - James Manson and next to him looks like Tommy Macdonald, behind him I think is Shona Macdonald. Isn't the tall girl at the back, near the middle, Marilyn Mackay? - about two right of her I think I can just see Lesley Ross. 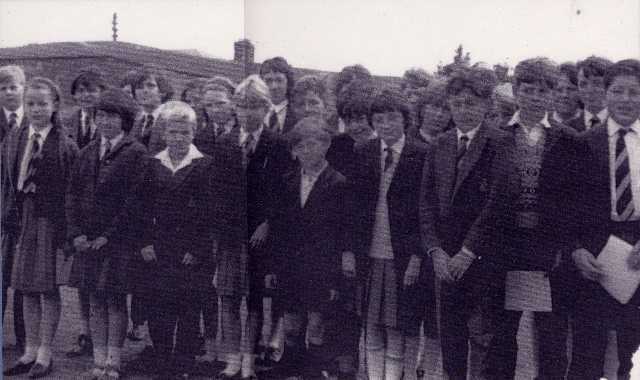 Think the fair-haired boy at the extreme left of the picture is my brother Donald Urquhart. He was in the same class as, and good friends with, Alan Donald and James Manson. Sorry Morag, but that is definitely Ross Dalgarno. 4th from left Barbara Rhind. Behind her I think Alana Ritchie and tallest boy a back centre: George Mackay. I've looked at this photo quite a few times over the years and I'm wondering where I am in it. I should be obvious from the dodgy short back and sides haircut I used to get (grin). That changed though when I ended up getting my hair cut in the wee "shop" down (I think) King Street which was owned (again - I think) by Lesley Ross' mother. I think that there should also be Helen Allison, Maureen Fraser and Maureen Coghill in the mix somewhere. I agree with all of the above names but, there is a better class photograph that I should try and look out. We had a reunion, more Academy than primary though, a few years ago and that also has a good photograph with names. That will be with the original one from p7. I'll figure out how to submit a photo for inclusion and upload those when I find them.